Photographic old movie poster of the cult Hollywood film, Rambo First Blood Part II, for sale. This is an actual surviving vintage poster of the 1985 action film starring Sylvester Stallone. 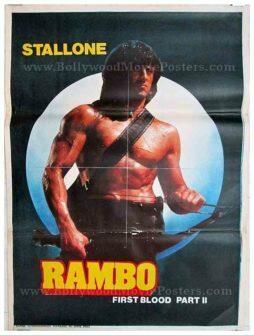 Designed, printed and circulated in India somewhere in the 1980s, this movie poster is an excellent example of how posters of Hollywood films were “Indianized” for their local release in the country. In the poster, a still photograph of Sylvester Stallone has been pasted against a minimalistic background. The poster features extensive damage along its folds – with some of the cracks missing pieces along the bottom fold. Hence, this poster has been graded as ★ As Is. Rambo: First Blood Part II (also known as Rambo II or First Blood II) is a 1985 action film starring Sylvester Stallone. The screenplay was by Stallone and James Cameron. A sequel to 1982’s First Blood, it is the second installment in the Rambo series, with Stallone reprising his role as Vietnam veteran John Rambo. Despite negative reviews from critics, Rambo: First Blood Part II was a major box office success and continues to inspire countless spoofs, games and imitations till today.